Receiving the 2015 Benjamin Franklin Award in Austin, Texas. My mother was a great fan of Benjamin Franklin. She was an entrepreneur and self-starter herself and she spoke frequently about Ben’s many successes: publishing newspapers; establishing a subscription library and philosophical society; a fire company; a hospital; a militia; becoming postmaster of Philadelphia; proposing the University of Pennsylvania; performing electrical experiments (the lightning rod!) and on and on to signing the Declaration of Independence and enabling peace negotiations with France and Great Britain. The first lesson: nothing hinders success more than lack of ideas. She spoke about him so often that, as a child, I assumed we were relatives. 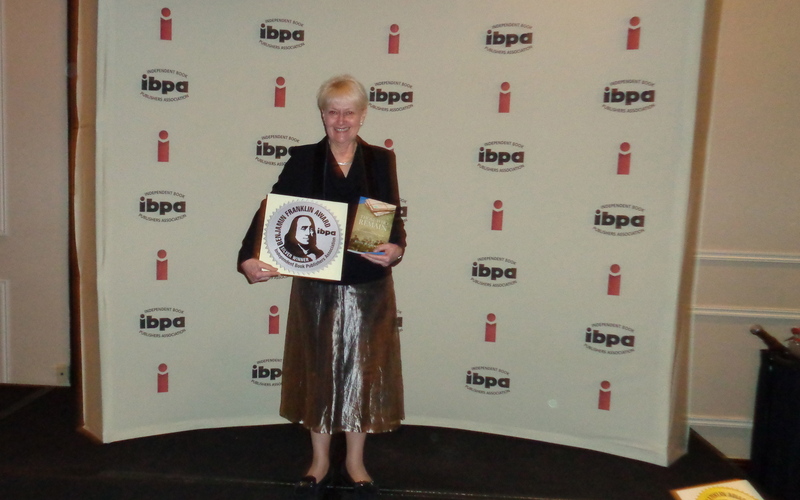 I thought of my mother when I was honored with the 2015 Benjamin Franklin Award by the IBPA for my memoir, Those Who Remain: Remembrance and Reunion After War. She died years before the book was born, but I felt her influence as I battled continuous rejections by publishers. Once the book was written, the idea of giving up on its publication became impossible. It was only a question of when. I don’t know exactly how my mother planted the seeds of industry and determination in her children, but she did, and I’m happy to be associated with any famous person she admired (although Mata Hari was pretty high on her list, too). The second lesson: believe in yourself and your product – in my case, the story I wanted to tell. Now, in the spirit of Ben, I’d better get on to my next project.